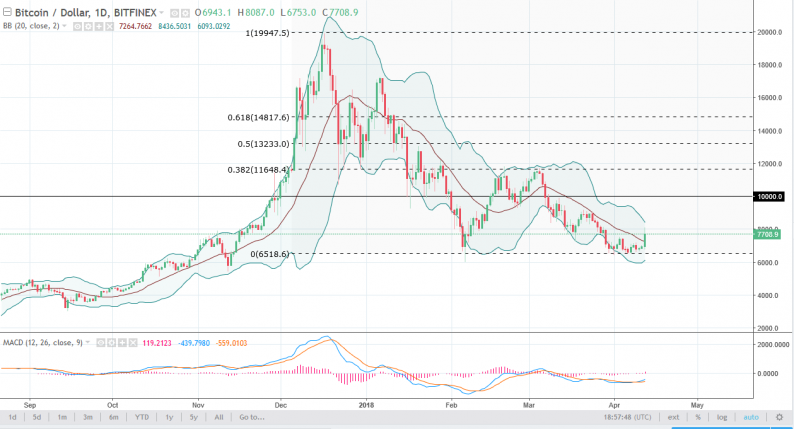 Bitcoin rallied significantly during the trading session on Thursday, breaking above the 7600 level and gaining 10%. This is a major move as the market has been so soft. However, when you look at the daily chart you can see that even if we bounce from here, in the big scheme of things it doesn’t mean much. I believe that there is a lot of resistance at not only the $8000 level but the $9000 level after that. If we show signs of exhaustion, I think the sellers will come back. However, if we were to break above the $9000 level, I think at that point we would probably go looking towards the $10,000 level next. I see significant support below extending down to the $6000 handle, meaning that if we were to break down below that level, the market should continue to unwind rather drastically. While this has been a very good day, we still are very much and what has been a very negative market. Bitcoin markets rallied significantly against the Japanese yen as well and managed to break above the ¥800,000 level. I think if we break above the top of the range for the day, the market should then go to the ¥1 million level via the ¥900,000 level. I believe that eventually we will find sellers and reach back towards the ¥700,000 level again. 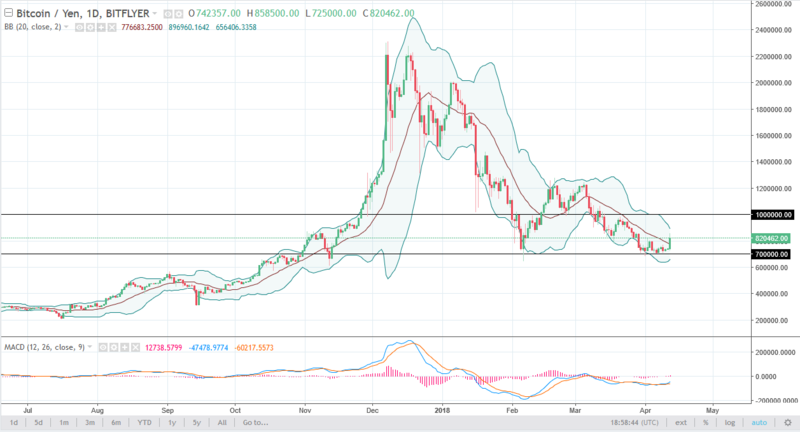 However, I recognize that a move above the ¥1 million level would give the market the ability to go much higher, perhaps reaching towards the ¥1.25 million level. A breakdown below the ¥700,000 level should send this market down to the ¥500 million level, perhaps even the ¥400 million level. Ultimately, I think that even though we had a very good day on Thursday, the sellers are still going to be very aggressive.